By Tim Royner: Fans won’t be able to see Kell Brook (37-2, 26 KOs) this Saturday night after he suffered an ankle injury and was forced to pull out of the Matchroom Boxing card headlined by Dillian Whyte vs. former WBO heavyweight champion Joseph Parker at the O2 Arena in London, UK, Brook was supposed to be fighting junior middleweight contender Brandon Cook as the chief support for the Whyte-Parker fight. There’s no word how long Brook will be out with his current injury. Brook’s promoter Eddie Hearn isn’t certain whether he should be scheduled against another opponent for September or kept outside of the ring until December, which is when he wants to match him against Amir Khan. Brook has become increasingly more injury prone since his knockout loss to Gennady Golovkin in September 2016. Brook made it though training camp for his last fight against Sergey Rabchenko, but it looks like another injury bug has bit him in his prep for the Cook fight. The fight would have earned the 32-year-old Brook a title shot against World Boxing Organization 154-pound champion Jaime Munguia (30-0, 25 KOs) as the mandatory challenger. However, that won’t stop Brook from getting a title shot against the 21-year-old Munguia. Brook’s promoter Eddie Hearn has deep enough pockets with his deal Sky Sports to lure Munguia and his promoters at Golden Boy and Zanfer Promotions to give him a title shot against the hard-hitting Mexican fighter soon. Before the bad news of the injury, Brook was on course to pick up his second straight victory since losing to middleweight champion Gennady ‘GGG’ Golovkin and Errol Spence Jr. in back to back knockout losses. In both fights, Brook suffered eye injuries that required surgery and time off to recover. Brook came back from the latest eye surgery to defeat Sergey Rabchenko by a 2nd round knockout on March 3 in Sheffield, England. 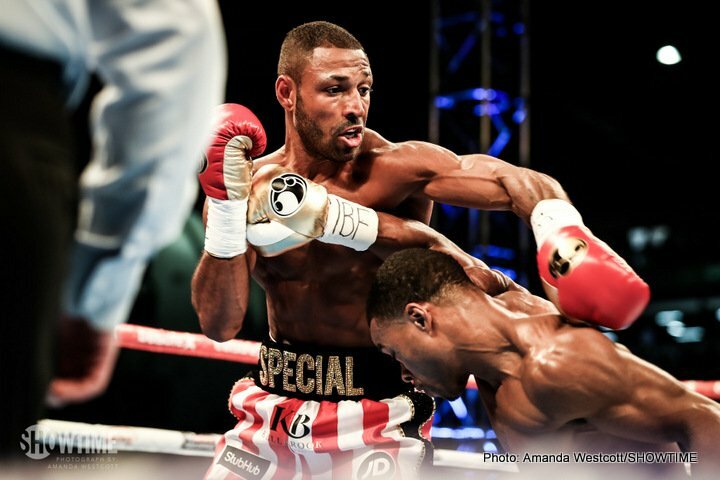 It was a good performance for Brook in his first fight at junior middleweight. However, the fight failed to prove that Brook can hang with the big dogs at 154 like Jermell Charlo, Jarrett Hurd or Erislandy Lara. Those are the big three at junior middleweight and considered to be the best in the division by the boxing public. Rabchenko is a fringe contender at best, and not viewed as a relevant fighter. Although Brandon Cook is ranked #4 by the WBO at junior middleweight, he’s not considered to be a top talent by fans. Cook would have been a slight upgrade for Brook over Ranchenko. The fact that Brook’s promoter Eddie Hearn wanted him to fight Cook suggests that he’s not taking any chances with him losing again. Hearn wants to match Brook against Amir Khan as soon as possible so he can take advantage of the fan interest in the UK to see the two face each other. Hearn wants to make the fight before Brook or Khan lose again. That’s one of the reasons why Hearn has Khan matched against another weak opponent in Samuel Vargas on September 8 after having him fight journeyman Phil Lo Greco last April in his comeback fight. Hearn wanted former welterweight Sam Eggington (23-4, 15 KOs) to face Brandon Cook (20-1, 13 KOs) to take the co-feature spot to fill in for the injured Brook. However, Eggington suffered an injury as well and had to pull out of the fight after getting hurt sparring. In a strange move, a heavyweight fight between journeyman Dave Allen (13-4-2, 10 KOs) will face Nick Webb (12-0, 10 KOs) in the co-feature. This is a British heavyweight title eliminator. That’s not the type of fight that you would think worthy of a co-feature spot on Sky Sports Box Office.